Lake view home at the spectacular Windsor Hills: Only 10 minutes to Disney! Summer is booking up FAST. Don't miss out to stay in one of the best town homes in Windsor Hills: Only 10 minutes to Disney. Tasteful updates in September 2018 include: new paint throughout, new plush carpeting, new bedding, updated furnishings, new towels and brand new kitchen essentials. Welcome to Queens Landing, our beautifully upgraded 3 Bedroom, 3 Bathroom Windsor Hills end unit town home. We are located less than 100 yards from the clubhouse and amazing community facilities. Windsor Hills Resort Orlando is perfectly located only 2.5 miles away from the Walt Disney World Resort and widely regarded as one of the best vacation communities in Central Florida. With over 60 restaurants, 4 supermarkets, several gas stations, drugstores and retail stores within a 5 minute drive from our home, you couldn't find a more ideally located resort in the Orlando area. • Open concept Living/Dining/Kitchen space with laminate floors. • Pull out Queen Sofa bed in the living room. • Fully equipped kitchen with granite counter tops, stainless steel appliances, dishwasher, REGULAR AND KEURIG coffee maker available . • Granite Counter Breakfast bar that overlooks the family room. • Seating for 4 at the kitchen table with 4 additional bar stools at the breakfast bar. • Master bedroom King suite with en-suite, large bath/shower and wall mounted LCD TV. • Main Level Queen bedroom suite with en-suite shower and wall mounted LCD TV. • Twin bedroom suite in a Classic Disney theme equipped with two twin beds, en-suite bath/shower and wall mounted LCD TV. • Full size front loading washer and dryer located upstairs. • Private heated*** splash pool with lanai. • Private paved driveway with parking for one. With other spaces close by. • All bath towels, pool towels and linens are provided. *** pool heat available at an additional daily charge of $15.00 USD plus tax per day. Also available for your convenience are pool noodles, large rolling cooler with ice packs for the pool or beach, 2 hairdryers and a small lock box in the master bedroom. Like all vacation rentals our home is a "self-catered" vacation home. Guests are responsible for providing all cleaning supplies, laundry detergent, paper goods and other personal items for their use. The complimentary items below however are provided as a convenience for you when you first arrive. Any food left behind by the guest, including condiments, non-perishable food items and spices will be discarded to comply with the Florida State Regulations. Our home is cleaned and inspected by professional cleaners prior to your arrival. Mid-stay cleans or daily housekeeping is not included in the quoted rental rate. If you require a mid stay clean for an additional fee, please let us know. * Earlier or Later check in or departure times can be negotiated for an additional fee should scheduling permit. Windsor Hills is perhaps Orlando's best gated resort community with world class amenities all of which are free for our guests and only STEPS from our TownHome! Below are some our highlights. •	Double Olympic sized, lagoon styled resort pool. •	Zero entry pool: accessible to infants and toddlers. •	Pool is heated during the winter. •	Welcome Center with friendly staff for tourist related information/assistance. All inquiries will be promptly answered by the owners so we can provide you additional information if you have any questions. Please be advised that your reservation will be both booked and confirmed directly from the owner after your initial payment has been placed. After booking you will receive a rental agreement directly from the owner by email. Cleaning Fee - $100.00 plus tax. 25% Deposit required to hold reservation dates with the balance due 90 days prior to check-in. A guest starter package of: One roll of toilet paper in each bathroom, one roll of paper towel, one dish sponge, one trash bag in each trash receptacle, one dishwasher detergent tab, one laundry detergent sample and one small bottle of dish soap is included in your stay. Should you need any assistance during your stay, you can contact the management company or the owners directly. We will make every effort to address the issue immediately. We are a family of 5 who fell in love with Windsor Hills years ago. We hope you can make as many memories as we have in your stay. We are very active property owners who stay at this unit frequently. We very much take pride in this home and we want to make sure your stay is as pleasant as ours. LOVE this property!! Can it get any closer to all of the fabulous Windsor Hills amenities? We think not. As an added bonus, our town home has no rear neighbours, only one side neighbour and a lake view from your bedroom. Only 2 miles from the Disney super highway and 15 minutes from Universal (our favourite) you won't be disappointed in our location! toilet, shower, Located on Main Level with Bedroom privilege. Property has a view of a small lake to the rear of the property. 1 parking space. Additional parking available in guest overflow area's. 4 additional bar stools available for seating. Screened patio with private splash pool with pool safety gate. Outdoor tennis and basketball courts located in Windsor Hills. Court hours: 8 am to 10 pm. Putting green located onsite. Mystic Dunes Golf Club is located next to Windsor Hills Resort. Please check with them for fees. Screened patio with private splash pool with pool safety gate. Heat available for an additional fee of $15.00 USD plus tax per day. 140,000 gallon, heated resort lagoon pool, water park slides, resort hot tub, just across the road from this town home. Resort hot tub located next to resort pool. Hot tub hours: 8 am to 10 pm. Refundable Damage Deposit * Included in price* - $250.00 Cleaning Fee - $100.00 plus tax. 25% Deposit required to hold reservation dates with the balance due 90 days prior to check-in. A guest starter package of: One roll of toilet paper in each bathroom, one roll of paper towel, one dish sponge, one trash bag in each trash receptacle, one dishwasher detergent tab, one laundry detergent sample and one small bottle of dish soap is included in your stay. We chose this home as we have stayed in the same community previously. 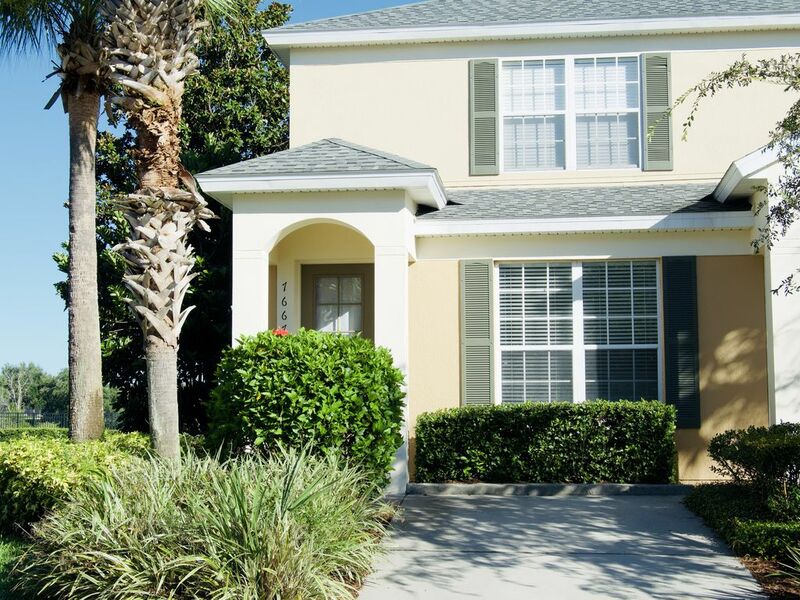 It is perfectly located with great Amenities near by and the Disney parks are very close. This home was beautiful, and unbeatable in price. The pictures have no bearing on how well appointed this home was. The owners did an outstanding job on assuring anything you need on your trip is taken care of. The kitchen has everything needed for your cooking needs. They even thought to include a pack and play, high chair, car seat, ice chest, and many other handy items I’ve never seen at a vacation rental before. The bed linens were clean and some of the most comfortable I have ever slept in. The maintenance staff visited when we arrived and made sure everything was up to standard. The owner also corresponded through email to make sure all was well. We will continue to use this specific rental in the future. Thank you very much! We are so happy you enjoyed your stay and we love that you continue to choose Windsor Hills when vacationing in Florida. It's honestly the best! More importantly however we are honoured that you would choose to come back to our home specifically - We welcome you back any time! One of the best parts of our vacation in Florida! Beautiful home, super comfortable beds, which were greatly appreciated after long days at the parks! It had everything we needed, and more. Convenient location, close to parks, stores, restaurants. We also enjoyed relaxing at the community pool. We would highly recommend for numerous reasons, including the gracious owners who responded promptly to any questions we had. Wow!! Thank you so much Christine for your kind review. We are so happy you enjoyed your stay and it was a pleasure chatting with you. Please come back anytime. We would be happy to have you and your family stay again ! Great stay! Quiet neighborhood so close to clubhouse pool and Disney! Owners were great to work with. Property was clean and as pictured. Rooms are larger than they look in pictures. Well stocked kitchen. Welcome kit of items much appreciated. Good amount of towels and baby gate/bed rails. All beds are very high. Our 5 year old slept with railing on bed but with younger ones would be more nerve wrecking. Have a pool alarm to keep littles safe. Again, location to Disney is amazing! Would stay again. Was wonderful they let us choose just a couple days to pay to heat the private pool. Really appreciate that! We would return if we're back in the area. Beds and bedding were comfortable! If I had to fix things and I'm nitpicking I'd say there aren't any bath mats and the master bath is fine but hasn't been renovated and I'm guessing it's on their list next. Thanks for a great stay! Again we are so happy you enjoyed your stay, please come back anytime ! Excellent townhome for a family vacation! The townhome was very clean and nicely furnished. The resort complex was fantastic and we really enjoyed having our own heated pool. The amenities are superb and we enjoyed using the main pool, the movie theater and the playgrounds. The entire property appears to be well cared for and it was very clean. We enjoyed the quietness of the neighborhood as well considering we were travelling with two small children. Our unit looked exactly like it did in the pictures and our experience with the owners was fantastic. We would definitely stay here again! Wow, thank you very much for the amazing review Melissa. We are so happy you had a great time in our home. We are pleased you enjoyed the complex and are happy everything met your expectations. We welcome you and your family back anytime ! Recommended. Would stay here again. Thank you Jordy and Laura for the excellent management of the property which helped us to have a great stay. We travelled with 2 young boys and we loved the house and the condo. The location is top as it is as near as you can be to Disney, it is very close to many restaurantes, supermarkets and main roads. Its excellent as well if you want to go to Tampa as you dont get the Orlando traffic. The house was just of right size for us with 3 nice bedrooms and WCs. The internet, the pool, the TVs and all the equipment worked really well. Any questions or issues were promptly and well resolved. We ended up not benefiting from the lovely condo but it has a great swimming pool area and a playground for the kids. There is a small shop, gym and play room as well. We would definately stay here again. Keep up the standard Jordy and Laura! Thank you Karl for such a nice review. We are happy to hear you found the speed and high standards of our property management company satisfactory. They are honestly the best ! We hare happy you and your family had a nice stay and we welcome you back anytime. Thank you very much Eloisa for your review. We are happy you enjoyed yourself. Come back anytime ! Windsor Hills is the closest 5 Star Gated Resort to Walt Disney World Resort, just 2.5 miles. Sea World is 12 miles, Universal Studios 16 miles, Legoland 31 miles and the Kennedy Space Center 64 miles. Windsor Hills is an easy 25 minute drive from Orlando International Airport and just 3 miles off Interstate 4. For the golfer there are endless choices as close as 1.5 miles and the championship courses at Reunion and Champions Gate are an easy 10 minute drive. There are scores of restaurants along Highway 192 with menus to suit every taste and budget. The resort has its own sundry shop and larger supermarkets are just a few minutes away by car. Further afield there is boating and fishing in local lakes and the Atlantic and Gulf Coasts of Florida are easily accessed in 1 hr 15 mins and 2 hours respectively. Orlando is a shopaholics heaven with major malls and a host of designer outlets where major brands can be purchased at a deep discount.